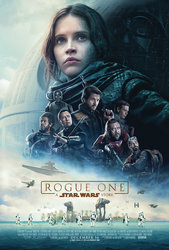 Rogue One: A Star Wars Story is in cinemas now and to celebrate, we are giving away 10 sets of amazing RealD Rogue One 3D Glasses! To celebrate the release, our friends at RealD 3D are giving you the chance to win a set of amazing Rogue One: A Star Wars Story RealD 3D Glasses! Ten lucky winners will each take away a complete set of these amazing and limited edition glasses. To be in with a chance of winning one of 10 complete sets of these ultra-rare, ultra-cool Rogue One: A Star Wars Story RealD 3D Glasses, just answer the question below correctly. The competition closes at 23.59 (GMT) on Wednesday 28th December 2016.